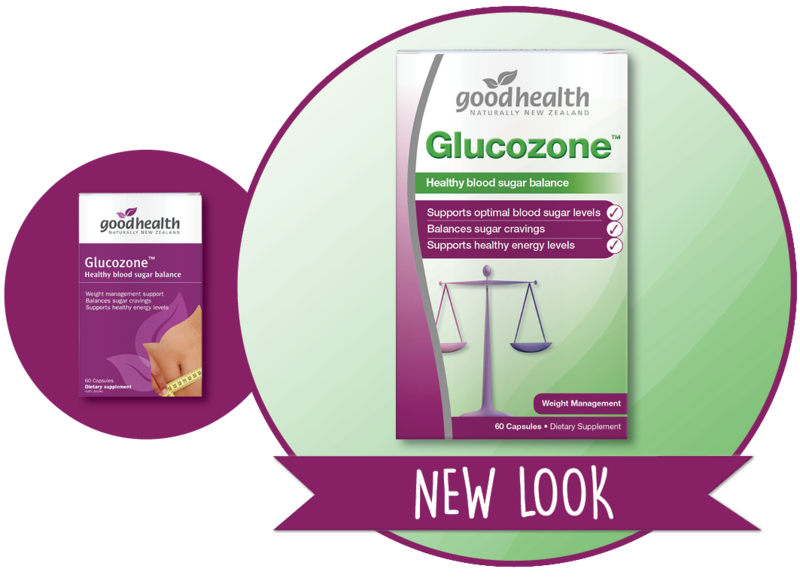 Good Health Glucozone™ is a weight management formula designed to support healthy blood sugar and energy levels. It also targets stress and helps to balance sugar cravings. Glucozone™ contains the key herbs; Gymnema and Cinnamon and minerals; Chromium and Zinc, which help your body transport glucose into your cells, where it can be used for energy. The herb Withania is included to support the body in times of stress and fatigue and nourish the adrenal glands. This comprehensive formula may also support healthy cardiovascular function and cholesterol levels. Glucozone™ is best used in conjunction with a healthy, low GI diet and exercise programme. Adults: Take 1 capsule 2 times daily with food or as professionally advised. Caution: We advise people with diabetes to monitor blood sugar levels while taking this product. If symptoms persist consult your healthcare professional. Vitamin supplements should not replace a balanced diet.